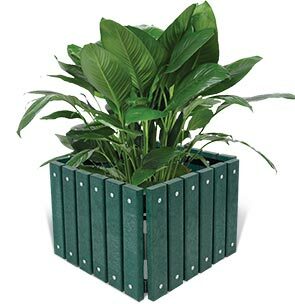 Make a great outdoor setting with highly-durable square recycled plastic planters. Environmentally responsible construction from the finest recycled plastic that is easy to keep clean and will not collect mold, mildew or insects. Planks are secured to an all-steel frame, made utilizing a 7-gauge upper plate and 10-gauge bottom plate. Long-lasting and maintenance free, these eco-friendly recycled plastic planters are ready for year-round outdoor use.